For Immediate Release – Oklahoma City, Okla. – May 4, 2017 – The National Reining Horse Association (NRHA) is excited to announce its newest unofficial earner of the Million Dollar Sire milestone, Hollywoodstinseltown. The 2004 AQHA Palomino stallion, owned and bred by David Silva, Sr. joined this elite club after his offspring’s great success at the 2017 National Reining Breeder’s Classic (NRBC). Together, Hollywoodstinseltown’s offspring unofficially earned over $52,000 throughout the event. Hollywoodstineltown is by NRHA Hall of Fame Inductee and Six Million Dollar Sire Hollywood Dun It and out of NRHA Hall of Fame Inductee Miss Tinseltown. His success isn’t limited just to the breeding shed; Hollywoodstinseltown boasts over $185,800 NRHA lifetime earnings (LTE) during his show career. 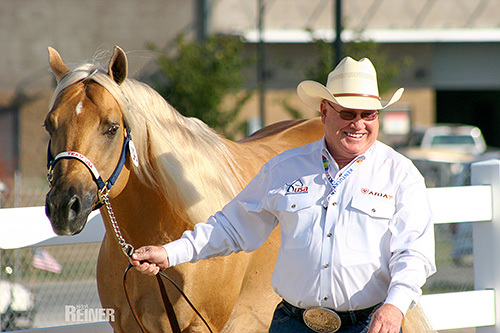 The flashy palomino’s accomplishments include: 2007 NRHA Futurity Open Prime Time Champion and Open Level 4 finalist with NRHA Hall of Fame Inductee and Three Million Dollar Rider Tim McQuay; 2008 NRBC Open Level 4 finalist with Tim McQuay; 2009 NRBC Open Level 3 Champion and 2009 NRHA Derby Open Level 4 Reserve Champion and Level 3 Open Champion with Marco Ricotta; 2010 NRBC Level 4 Open finalist with March Ricotta; 2010 Alltech FEI World Equestrian Games ™ Team Competition Gold medalist and Individual Competition fourth place. NRHA congratulates Hollywoodstinseltown and his owner, David Silva, Sr., for achieving Million Dollar Sire status.